1. Amelia is feeling much better. When I took her in to the pediatrician on Thursday for her follow-up appointment, he diagnosed her with double ear infections. So she got a shot of Rocephin and another appointment for the following day. Friday, her ears weren't much better (we were up half the night Thursday night), so she got another Rocephin shot on Friday, with a seven-day course of Omnicef to start Saturday morning. Those things, combined with Tylenol, have helped her ears a lot. And although on Friday the ped told me that he felt like we'd probably have to go into the ER over the weekend for IV fluids (because she was still not making wet diapers and her fluid intake was still very low), we didn't! Her eating has picked up, and I am hoping that it continues to do so over the week ahead. I'll still post more about the last week as this week continues, because there are so many in our family who are interested to see how it all developed. Hope that's okay with you all. 2. 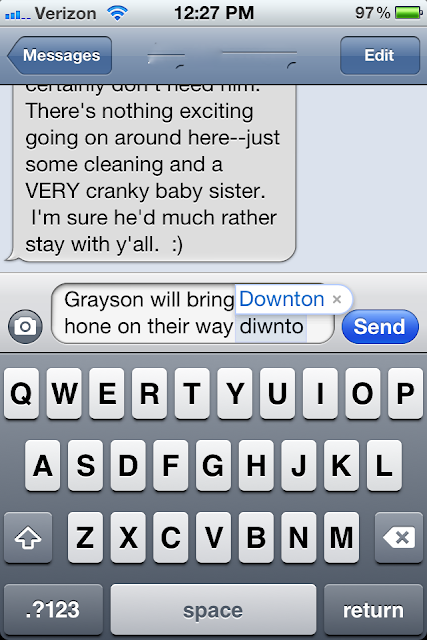 My phone finally recognizes "Downton" as a word! SOOO glad she's doing better. We've been praying for little Amelia. And...we found out we're having a girl. We're all very excited. So relieved she's better. And how often do you text about Downton, anyway? So happy for Amelia, and of course for your phone. Downton, #FTW! Very happy to hear that Amelia is feeling better! Continue to keep us posted.